GearWrench medium ratcheting tap and die drive tool 5 piece set. GearWrench sae medium ratcheting tap and die drive tool 40 piece set. GearWrench metric medium ratcheting tap and die drive tool 40 piece set. GearWrench sae/metric medium ratcheting tap and die drive tool 75 piece set. 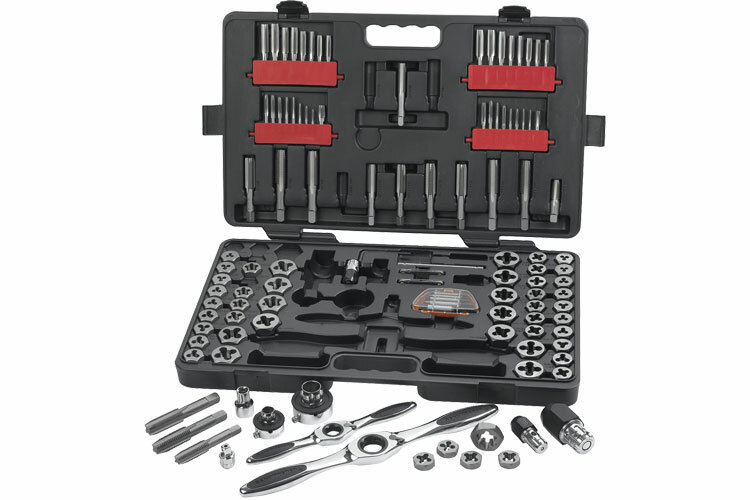 The 82812 GearWrench SAE/Metric Large Ratcheting Tap and Die Drive Tool 114 Piece Set is one of thousands of quality tooling products available from MRO Tools. Please browse GearWrench Ratcheting Tap and Die Sets for tools similar to the 82812 GearWrench SAE/Metric Large Ratcheting Tap and Die Drive Tool 114 Piece Set. 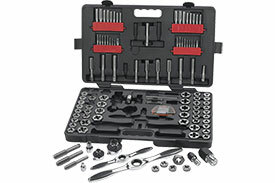 82812 GearWrench SAE/Metric Large Ratcheting Tap and Die Drive Tool 114 Piece Set description summary: GearWrench sae/metric large ratcheting tap and die drive tool 114 piece set Quantity discounts may be available for the 82812 GearWrench SAE/Metric Large Ratcheting Tap and Die Drive Tool 114 Piece Set. Please contact MRO Tools for details.